Patient Education — Spectrum Eye Care, Inc.
Disclaimer: The information and reference materials provided are intended solely for the general educational purposes and discussion with patient’s own physician. Information presented here is not intended to diagnose or treat health problems or take the place of professional medical care. Nearsightedness (myopia) is a vision condition that causes blurred distance vision but near vision is often clear. Blurred distance vision is most often noticed with tasks such as seeing the whiteboard at school, watching the television, or driving. The eyeball is too long or the cornea has more curvature than needed to focus light precisely on the back of the eye. This condition affects approximately 1/3 of the U.S. population. Nearsightedness can be corrected with spectacles, contact lenses, or other refractive procedures. Farsightedness (hyperopia) is a vision condition that often allows distant objects to be seen clearly but near vision is blurry. The eyeball is too short or the cornea has too little curvature to focus light precisely on the back of the eye. This can lead to difficulty eye strain, headaches, concentrating, and intermittent blurred vision. In mild cases of farsightedness, the eye can compensate for this by accommodating but it can sometimes cause eyestrain. This can be corrected with spectacles, contact lenses, or other refractive procedures. Astigmatism is a vision condition that causes blurred vision. The curvature of the cornea and lens bends light to focus it precisely on the back of the eye. With astigmatism the lens or cornea may have a different curvature in one direction causing light to be focused in two different places on the retina. This leads to blurry or distorted vision. Small amounts of astigmatism are common and may not have a large effect on vision. Astigmatism can be corrected with spectacles, contact lenses, or other refractive procedures. Presbyopia is a change in the crystalline lens that causes a decrease in the eyes accommodative ability. This decrease in accommodation makes near vision more difficult causing small print to become blurred and can often lead to eye strain. This change typically becomes noticeable in the early to mid 40’s and poor lighting conditions often exacerbate the problem. This can be corrected for with several different types of spectacles or contact lenses. The focusing or accommodative system in our eyes is what allows us to change focus on objects that are at distance and near. Sometimes individuals may have a weak focusing system which can cause blurred vision at near, eyestrain, and fatigue. Talk to your doctor about the issues you are having with extended near work and often a bifocal can help reduce symptoms. This condition can occur in younger patients as well and sometimes vision therapy to increase the strength and flexibility of the focusing system can be another solution. Also known as digital eye strain, computer vision syndrome is a group of eye and vision related problems that results from extended computer, tablet, or cell phone use. The average American worker spends 7 hours on a computer in the office or at home. The most common symptoms include eyestrain, headaches, blurred vision, dry eyes, and neck and shoulder pain. These symptoms can be exacerbated by poor lighting, glare on screens, improper viewing distance, poor seating posture, or uncorrected vision problems. One simple tip to help alleviate digital eye strain is to follow the 20-20-20 rule, take a 20 second break to look at something 20 feet away every 20 minutes. Is thinning or steepening of the cornea associated with irregular astigmatism and is most common in late teens to middle aged adults. Glasses are often not adequate to fully correct the vision, a hard contact lens that can provide a more regular surface to focus light on the back of the eye is typically more successful. Talk to a doctor about what option for visual correction is best for you. Also known as an eye turn, strabismus is a condition where the two eyes do not always align. This is often due to an imbalance of the extraocular muscles. Proper eye alignment is important to avoid seeing double, have good depth perception and to allow for proper development of both eyes. Also known as a “lazy eye", amblyopia is caused by a lack of neural development of central vision in one or both eyes. This can be associated with an eye turn or can be caused by a refractive difference between the two eyes leading one eye to do most of the work. Symptoms may include favoring one eye but often symptoms are not evident. Click here to find more resources about amblyopia and register your child in the Ohio amblyopia registry. Floaters are commonly described as small dots, squiggly lines, clouds or cobwebs moving in your field of vision. Floaters are tiny clumps of the vitreous gel that fills the back of the eye. These clumps cast a shadow on the retina causing them to appear as if they are in your field of vision. They are often seen more frequently when looking at plain background such as the blue sky, water, white paper, or a blank wall. Ocular migraines can occur with or without an associated headache migraine. Many people experience unusual visual phenomenons called a “visual aura.” These episodes of distortions sometimes described as spots, lines, lights or even like viewing through a kaleidoscope in one eye typically last no more than 30 mins. Some common triggers include aged cheeses, wine, caffeine, fatigue, stress, alcohol, bright lights, and hormonal changes. It is important to see your doctor if you experience this to rule out other causes of temporary vision loss, especially if you do not have a history of migraines. To learn more about ocular migraines, click here. Click the banner above, or here to learn more about meal planning, healthy eating habits, and great-tasting and healthy recipes! Lutein & Zeaxanthin are important nutrients found in green leafy vegetables, as well as other foods, such as eggs. Many studies show that lutein and zeaxanthin reduce the risk of chronic eye diseases, including age-related macular degeneration and cataracts. Essential Fatty Acids are a necessary part of the human diet. They maintain the integrity of the nervous system, fuel cells and boost the immune system. Research shows omega-3 fatty acids are important for proper visual development and retinal function. At the end of the day, eating to maintain eye health isn’t all that different from regular healthy eating. While diet is the key to getting the best vitamins and minerals, supplements may help. Talk to your doctor about what choices may be best for your eye condition. Click here to view the vitamins displayed above. Click the icon above to learn more about smoking cessation. People who smoke are at an increased risk for developing many eye disease including: cataracts, age-related macular degeneration, dry eye, and increased susceptibility to damage to the optic nerve. Contact your primary care doctor for resources to help with smoking cessation. A condition in which the eye's normally clear lens becomes cloudy. It eventually occurs in both eyes but may be more noticeable in one eye first. Since less light passes through a cloudy lens, vision blurs. Cataracts are small at first and may not affect vision. But the denser they grow, the more they affect your vision. Most cataracts are due to aging. Other risk factors include: Diseases like diabetes, eye injury or trauma, eye surgery for another problem, inheritance or pregnancy-related causes (Babies can be born with cataracts or develop them in childhood. ), overexposure of eyes to the sun's damaging ultraviolet (UV) rays, smoking, and certain medications. Click here to learn more about the process of cataract surgery, including the pre-operative testing process, frequently asked questions, and more! Also known as a “second cataract,” Posterior Capsular Opacifcation is a haze that develops on the capsule that holds the lens implant after the cataract is removed during surgery. This haze can develop months or even years after cataract surgery and patients often report it feels as though their cataract is coming back. The haze can typically be cleared with an in-office laser procedure. Visit your doctor today to determine if you this procedure may benefit you. AMD damages, then destroys central vision, which is our fine detailed vision. This eye disease takes two forms, dry and wet. About 90% of AMD cases are dry. The remaining 10% are wet, a more advanced form. Wet AMD is more damaging causing about 90% of serious vision loss. This image is an example of Macular Degeneration. The large bump in the center of the image is caused by an accumulation of drusen. These bumps break up the uniform smooth line that is needed to create sharp, fine, detailed vision. To aid the doctor in monitoring for changes in AMD a scan of the macula can be done called an OCT (optical coherence tomography). This scan shows the layers in the retina in fine detail and in a different angle than the doctor can see when viewing the eye. This precise instrument will help detect changes earlier and help patients get treatment as quickly as possible to preserve vision. 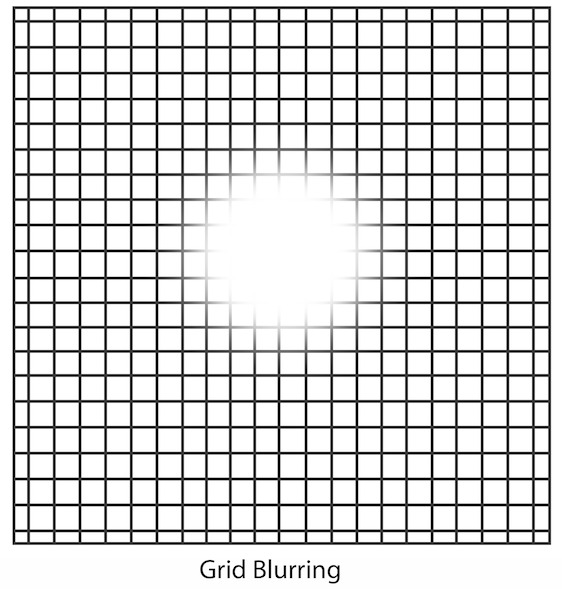 An Amsler grid is a tool used to detect vision changes at home. While wearing your glasses used for near, hold the Amsler grid at approximately 33 cm or 13 inches. Cover one eye and stay focused on the black dot in the center. Look for any wavy, squiggly, or missing lines in the grid. If you detect a change in your vision contact your eyecare provider right away. A group of related eye diseases that can cause blindness. Many people who have it don't know it. Symptoms don't appear until glaucoma has already damaged the optic nerve. This nerve carries images from the eye to the brain. Glaucoma is usually associated with an elevated pressure inside the eye (intraocular pressure). The most common type of glaucoma is primary open-angle glaucoma. Its causes are not yet clearly understood. Glaucoma can also develop without an increase in eye pressure, called low-tension or normal-tension glaucoma. For more information regarding Glaucoma, please visit our Glaucoma Management page here. Diabetics are at risk for developing several eye diseases: Diabetic retinopathy, glaucoma, and cataracts. Diabetic retinopathy is the most common eye disease in people with diabetes. It affects over 5 million Americans ages 18 and older. Usually both eyes develop the disease. Diabetic retinopathy progresses in four stages. The most severe is proliferative retinopathy. More than a third of people with diabetes don't get proper vision care. This puts them at higher risk for blindness. If you have diabetes, be vigilant about eye and vision care. People with diabetes, even those without diagnosed eye disease, need to see their eye doctor once a year. Those with diabetic changes in their eyes need to be seen more frequently. Dry eye is a disease where the ocular surface is affected by an imbalance of the layers of tear film which include the lipid layer, aqueous layer, and mucin layer. This can be due to several different causes including: ocular surface inflammation, hyperosmolarity, and tear film instability. Good quality tears are important to lubricate and nourish the eye to provide comfortable, stable, and clear vision. Symptoms may include: irritation, burning, stinging, scratchy sensation, excess tearing, fluctuations in vision, sensitivity to fans, A/C, wind or smoke. Meibomian Gland Dysfunction can also contribute to dry eye symptoms and is a condition where the oil glands in the eyelid become clogged or congested and do not secrete good quality lipids or oils on the ocular surface. This leads to a poor quality tear film and many of the above dry eyes symptoms. Blepharitis is inflammation of the eyelid commonly caused by bacteria and oil accumulation at the base of the eyelashes. Symptoms can include eyelid irritation, redness, and itching and burning. Blepharitis is inflammation of the eyelid commonly caused by bacteria and oil accumulation at the base of the eyelashes. Symptoms can include eyelid irritation, redness, itching and/or burning. Talk to your doctor about the importance of daily lid hygiene as well as the use of various products which can help alleviate this chronic condition. A non-painful bump on the eyelid due to inflammation of a gland in the eyelid. If it becomes chronic and doesn’t respond to treatment a minor surgical procedure may be needed. See a doctor urgently if there is any pain or tenderness of the eyelid which can indicate an infection and needs treatment. This is typically associated with ocular itching and watering but occasionally patients will be asymptomatic. A stringy white discharge upon awakening is often noted and bumps on the inside of the eyelids will be seen by the examiner. Artificial tears and cool compresses will typically reduce symptoms in mild cases. Talk to your doctor about options for allergy eye drops and systemic allergy medications that can provide more sustaining relief during allergy season. A red eye can be caused by a wide variety of things ranging from dryness and irritation of the ocular surface to inflammation and even infections of the eye. If you are a contact lenses wearer, stop wearing your contacts until you are cleared by your doctor to safely return to contact lens wear. Due to the wide variety causes, they are also a variety of treatment options. It is best to see your doctor to determine the cause and treatment of the red eye. Uveitis is inflammation of the uveal tract in the eye and typically causes pain, redness, light sensitivity, watering, and blurred vision. It can affect one or both eyes and can be recurrent. To determine the cause of this condition, bloodwork is often required. Causes can include auto-immune disorders, infections, viruses, trauma, post-operative, or idiopathic. Treatments for this can vary depending on the cause and usually include anti-inflammatory drugs and treating the root cause. Click this link for more information about uveitis.